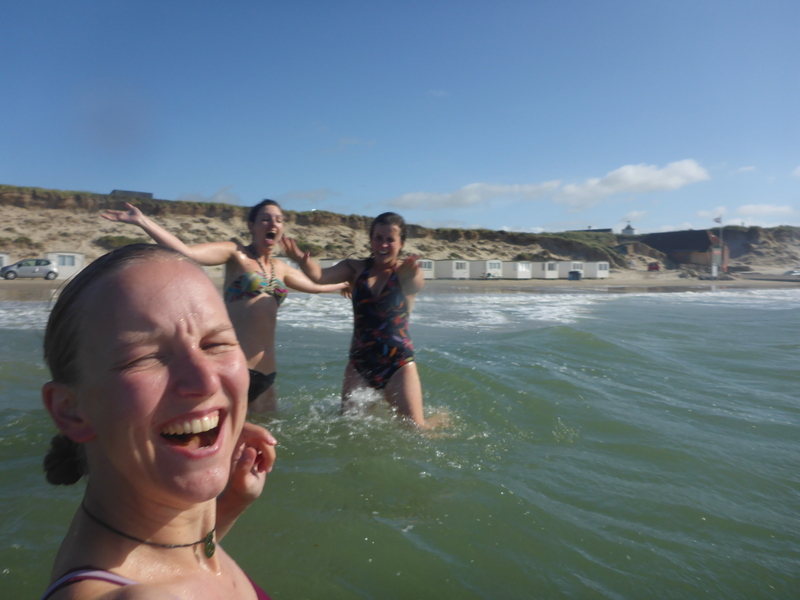 While on holiday in Denmark recently, my friends and I swam in the frigid North Sea at Lokken Beach on the north-west coast of Denmark. These photos are all taken in the space of about five minutes as we dashed in and out of the icy water. Other much hardier souls around us stayed in longer, but not much longer. 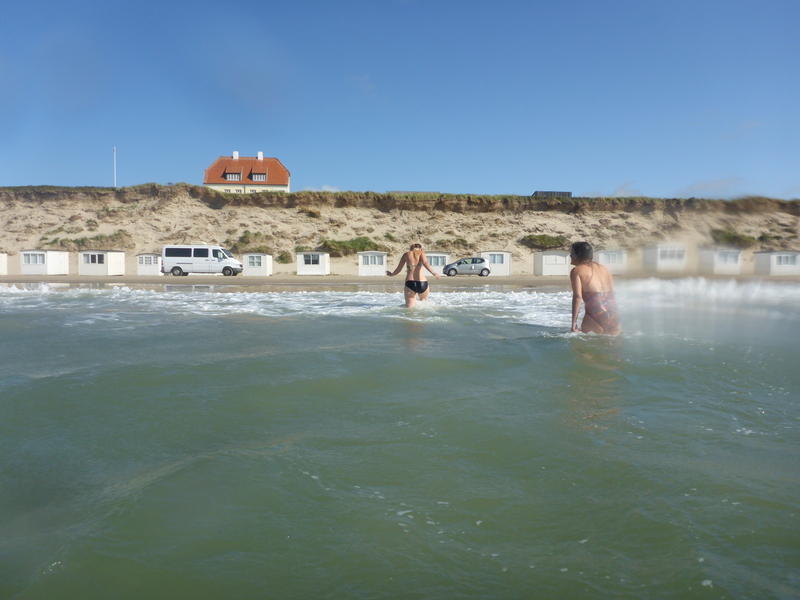 Although Lokken is a place of summer houses and seaside holidays for Danish locals, a dip in the ocean here is a more than refreshing experience. To say we had. While my friend Keryn was visiting in the summer, it became a running joke that rather than racking up countries visited as we traveled the world, we would instead try swim in every ocean. So when the chance presented itself to swim in an ocean neither of us had, we gamely slipped into our togs and squealed as we hugged our exposed bodies against the wind while running across the beach and finally plunging into the water. So, that’s the Atlantic Ocean ticked off, what’s next on the list? Kidding! To complete that list you would have to swim in the Arctic or Southern Oceans and hypothermia is not a price I would pay to complete a challenge. It got me thinking though, about the ‘life lists’ we make for ourselves and the sometimes arbitrary challenges we take up, just to say we did it; just to tick a box. We’re living in a goal orientated world, full of to do lists, bucket-lists, career goals and travel wish lists. We walk through life racking up experiences like it’s our job. Travel the world; write a book; finish a marathon; visit the latest pop-up event; climb the highest mountain; bike the length of the country. Not to mention the ultimate life-box trifecta of house, marriage and baby. Although I do love lists and I’m not about to stop making goals for myself, I have come to realise that the goals I make need to be thoughtful, and relevant for me. I know I’m the kind of person who likes completion, who likes to tick things off and get things done. But I need to make sure that the goals I make are for the right reasons. I’m keeping this in mind as I start to think about the next steps I want to take both on this blog and for my next year or few years. What do I want my late 20’s to be? What will I look back on and be proud of? What do I want to try out? Whatever my goals end up being, I am going to make sure they are tailored to me and something I can enjoy for the journey as well as the satisfaction of completing them. 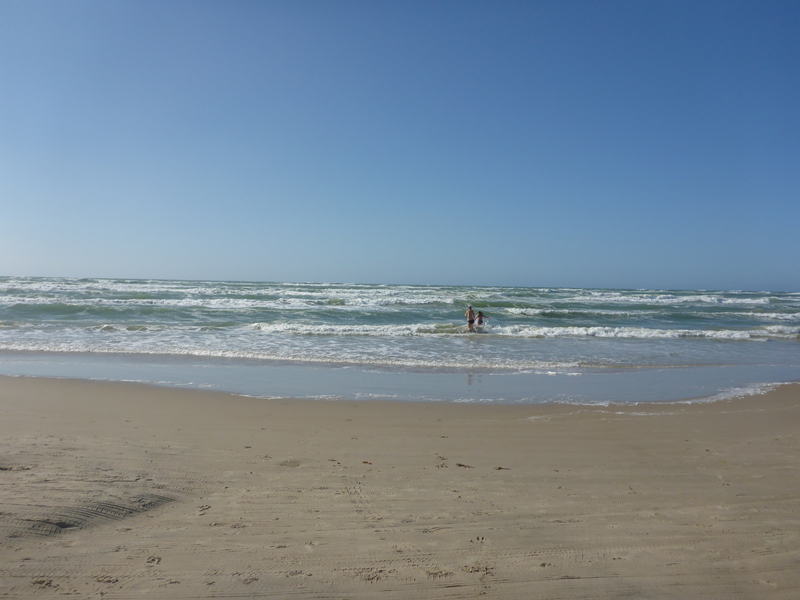 And, just for the record, I have swum in the Pacific and Indian Oceans already, so if I were to take on the challenge of swimming every ocean, I can already post a solid 3/5…. This entry was posted in 27 while 27....., Growing Up, Travel and tagged 27 List, challenges, goal setting, life lists by andieinspired. Bookmark the permalink.